I can define the Columbian Exchange [of the 16th century] and trace the spatial diffusion of products, ideas and diseases between the Old and New World. I can cite examples of the impact of the Columbian Exchange on both hemispheres. I can cite examples of American pop culture, trace the diffusion of these ideas, and describe the effect on the world. I will analyze in writing the spatial diffusion and impact of the Columbian Exchange by completing a graphic organizer and defend my choices in writing, citing evidence for my choices. I will analyze the impact of the diffusion of American pop culture on other parts of the world by interpreting visuals illustrating this diffusion and discussing the impact of that diffusion orally in class discussion. As you view the short video, focus on the types of diffusion? 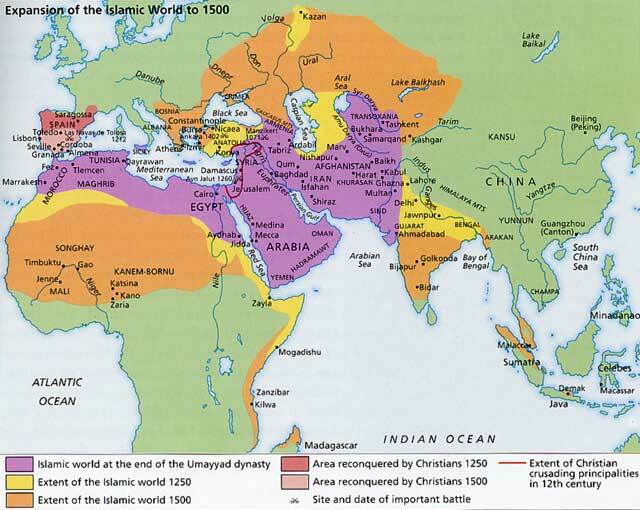 View the map of the Islamic World in 1500. How does this map illustrate reasons Christopher Columbus set sail westward in search of the “East” Indies? Access, download, and save the WGS_Impact of the Columbian Exchange_Unit 5 handout to your WGS desktop folder. Look at the graphic below and the handout to determine the types of products, ideas, and innovations that traveled between the two worlds after 1492. Think about the impact of this exchange on people in both the New and Old Worlds. Click on this link to get a bigger version of the Columbian Exchange map. Look over the items that moved by diffusion and contact between the Old World (Europe, Africa, and Asia) and the New World (the Americas). What surprises you or what is confusing? Say: Complete the short writing at the bottom of page 1 by choosing the five items/ideas/technologies you think are the most important legacy from the Columbian Exchange (for either the Old or the New Worlds) and defend your thinking by citing evidence. Post the completed handout as an assignment in the Hub.